Enova Runs at J.P. Morgan Corporate Challenge - Enova International, Inc.
We aren’t all athletes, but Enova has its fair share of competitors, which means events like the J.P. Morgan Corporate Challenge garner plenty of interest within the company. This year’s race featured a group of 72 runners from Enova. 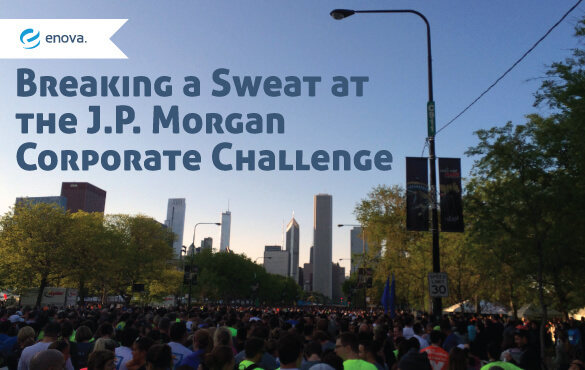 There were over 25,000 participants altogether, hailing from 594 different Chicago companies. The Enova team began the evening at 6 p.m., stretching together at the Enova team tent. The race began at 7 p.m., and afterward the group stuck around for hot dogs, hamburgers and drinks, and to congratulate the race’s third overall female finisher, Enova’s own Allie Walters! Allie finished the race with a time of 21:17. “I really enjoyed being part of Enova’s team,” said Allie, “and being able to compete up front in this year’s race. I was excited to improve upon my fourth-place finish from last year, and I’m proud to be part of such a big Enova showing! Allie and many more of our Enova colleagues will look forward to another chance to race next year.